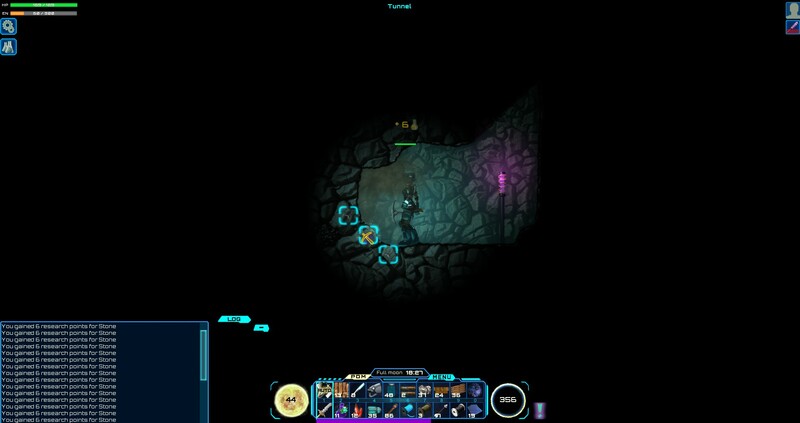 A while back we got to preview the sandbox survival game called Darkout. Back then it was the beta, and while it was fun, it was not without its quirks. Now we’ve got our hands on the finished version of the game, out on steam, and it is time to see how things have progressed. Since we’ve already covered most of the basics in the beta, we’ll be focusing on the improvements this time around. Do yourself a favor and check out the preview first, so you know where we’re coming from. The visuals haven’t changed very much since the beta. The enemies and player are 3D while rest of the game is decidedly less so. Because of the increased functionality, I was able to get a good deal further into the game, and as a result I got to see the results of some of the higher tier equipment. The booster boots, for instance, have a neat little flare effect, and the powered suits provide colored light depending on the crystal used in their construction. Applying power also gave my pistol and crossbow a piercing flashlight, which makes it feel more high tech and awesome, and actually shows off more of the world. This is useful, because as the name would suggest, this is a very dark game. You’ll spend most of your time underground, and the “day” is largely indicated by your time display. It isn’t terribly bright. 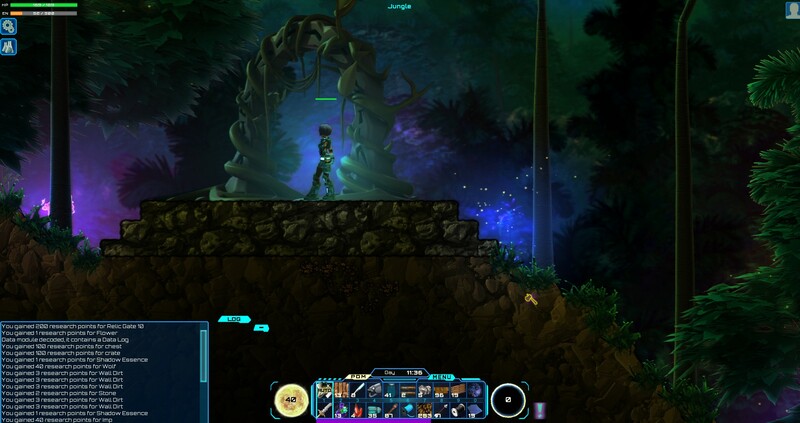 Much of the game depends upon you creating and maintaining lighting. Overall, that means that you’ll still experience most of the game as a minor gleam of eyes or luminescent plants on the edge of vision. I started to run into more substantial enemies in this run through as well, branching off from the spidery and doggie type stuff and moving onto the goblin and behemoth type creatures. I also found a few more impressive biomes, including a towering city and a dank sewer. 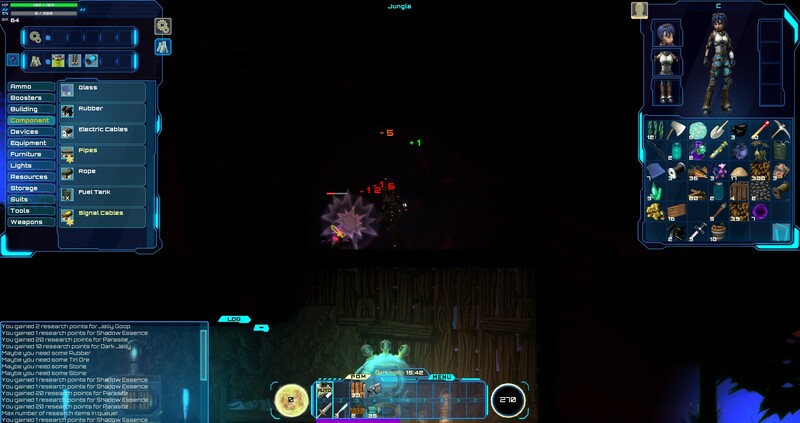 An update just before I wrapped up my review play added glowing worms and salamanders, which light up indoor and underground areas, providing more much needed color and visibility to the game. I was frankly impressed with the amount of improvement between the beta and the final version of this game. When I played through last time, I found myself having a heck of a time scrounging together enough materials to progress up the tech tree, and this was largely because of the difficulty in getting low level resources. Things like tar and tin, which are the raw materials to vital things like torches and early equipment, were rather difficult to come by. A few little tweaks added the ability to make tin from stone instead of just scrap, and tar is much more common. Good show. Things are a little volatile at the moment, with at least one major update while I was testing it, but overall the changes remain fairly positive. In the beta your crafting required you to enter a value into a box in order to craft more than one of something at a time. When I first started testing the game this box had been replaced with a slider. This was a VAST improvement. It kept me from switching from “game mode” to “data entry mode.” The subsequent update plopped in a few common amounts, ranging from 1 to Max with a few intelligent steps between. The bed, which serves as a spawn point and a healing apparatus, now causes a time skip when you use it. Not only does this make your health return in a flash, but it burns research and crafting time, making the “sitting on your hands” portion of the game far less prevalent. Good show. 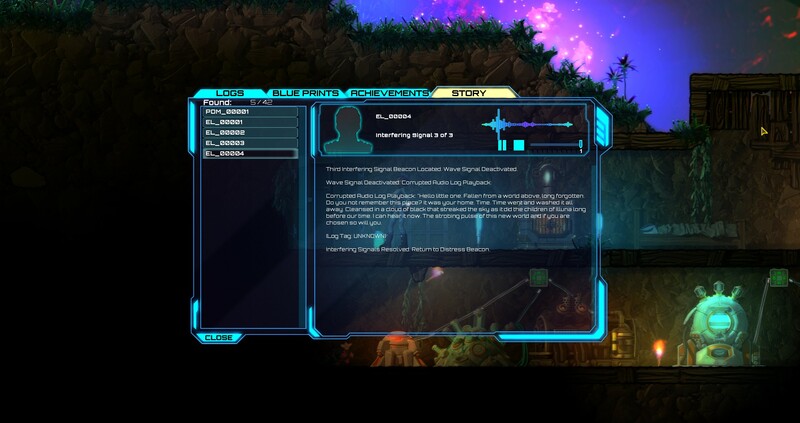 There’s even a little hint button letting you know what resource is holding up your progress along the tech tree. This will be a fairly frequent view. 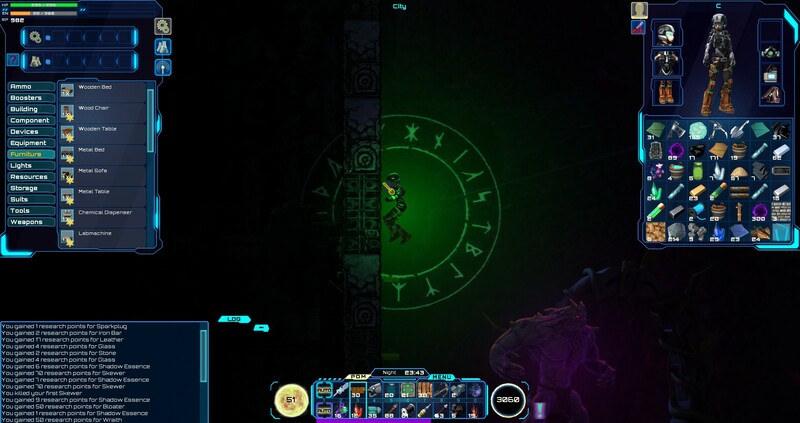 The best feature of the game’s functionality is the two-level action bar with the “auto” in the 0 slot. Auto selects the appropriate tool for mining, logging, or digging without you having to fill up three slots. What I used to do was plop a nice big sword into the slot below it, and then I was able to gather resources and defend myself all without fiddling with the mouse wheel. The mid-review update took that option away by throwing down a SECOND auto into the other slot, which performed what had previously been the shift click. I’m not entirely behind this change. For one, now I keep picking up the door instead of opening it. Such would be less of an issue for me if the change had happened BEFORE I started the review, and isn’t likely to be a problem for new buyers at all. Combat has been improved as well. Previously you had to “white out” an enemy before it was vulnerable to standard weapons. This was done by creating brightly lit arenas or loading down with bright lights. Or at least that was the idea. In reality it just meant that I did all of my combat with a torch, which did light damage and regular damage. 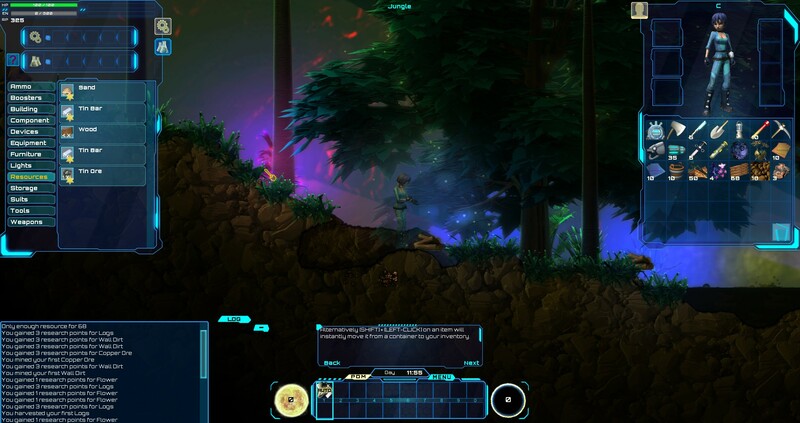 Now the enemies are always vulnerable to standard weapons, but they are significantly more vulnerable when lit up. Suddenly that fancy sword I made was useful! I’ll say this, to those of you interested in this game. If you pick it up and find you aren’t enjoying yourself, stick with it until you craft a power modulator. Once you have that (and eventually some batteries) the game changes drastically. 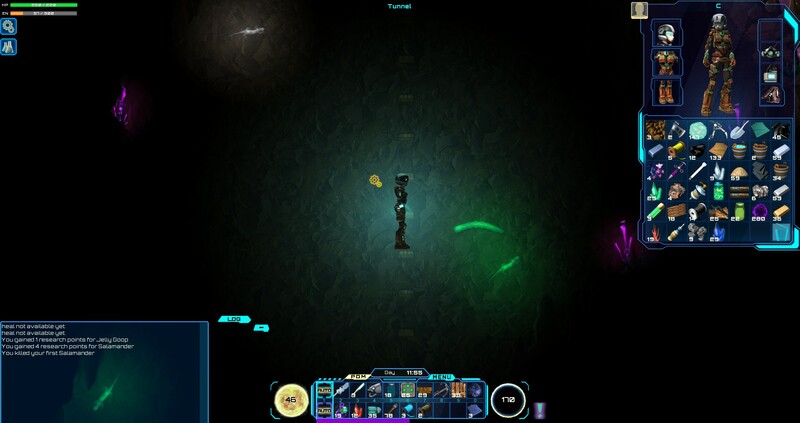 Now your armor glows, making the tedious switching between torch and auto no longer necessary. Now those booster boots you found give you a double jump. Now your pistol or crossbow lights up, weakening strong enemies and making weak ones like the weird bat things die just by aiming at them! It was a turnaround for me. The game’s main weaknesses, however, are entirely unchanged. The first is the downright inadequate documentation. 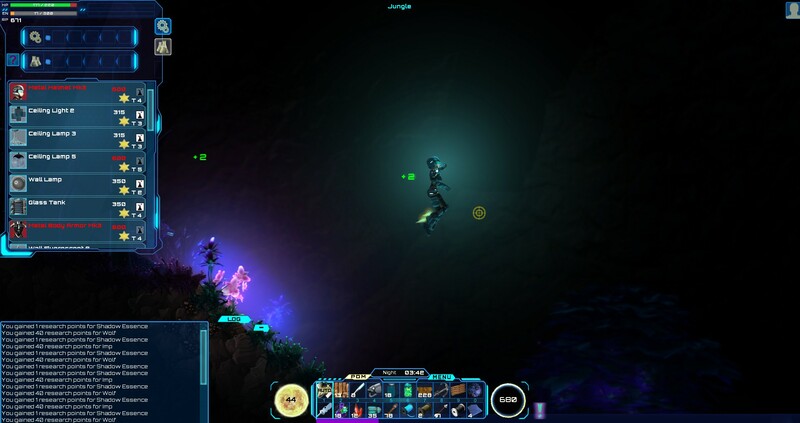 There is a recall system in the game which allows you to drop a beacon periodically and, in the event of your death, you can transport directly to it. I can’t describe how useful this is, because when you die you leave behind any equipped items and even reaching them again to retrieve them is an exercise in frustration, if you’ve covered any distance. The problem is that I had to check the forums to know how to use it. The same goes for the smelter, which aside from providing you with steel can actually reclaim metal from some crafted items. That was another gift from the forums. I would suggest that they are following the Minecraft formula of forcing you to figure out everything for yourself, but there are tutorials and tool tips, they just don’t make the operation overly clear. Seriously, if I knew half of this stuff from the game itself, I would have had a much better time of it from the very start. Even those things that are well documented, like wiring, continue to vex me with their complexity. The other weakness is that, though it is vastly improved from the beta, there are still a few undeniable technical kinks. Every time I place an elevator, it disappears when I load. Every time I exit, it crashes (which doesn’t really matter, because I was exiting, but still.) The story mode seemed to stop progressing at a certain point, despite the fact I’d fulfilled everything my voice-only guide had suggested I do. Ominous soundtrack and creepy animal noises, plus some minor voiceover. Most of the voice work felt like they just called over one of the devs and had him or her do their very best at a dramatic reading, with mixed results. The full game introduced a (frankly gorgeous) cinematic intro, and the aforementioned voice work helps fill you in on what’s going on. You crash land on a planet that you were hoping to escape. 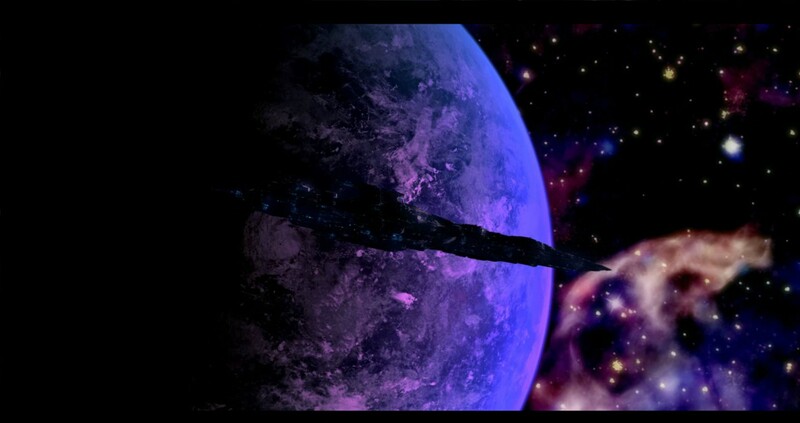 It is home to an extinct civilization and a host of beings called Shadow Creatures. You are among a handful of survivors, most of whom stopped qualifying for the term “survivor” after they failed to survive for very long. Most of the story centers around a guide who is communicating with you over your distress beacon, but as I said earlier, once he got to the part where he was telling me to make some leather, he seemed to lose interest in me. There was still a fair amount of flavor, mostly in the form of data modules giving snippets of other people’s observations and experiences, but any narrative thread petered out with my endless quest for leather and equipment crafted from it, no amount of which seemed to satisfy Mr. Distress. 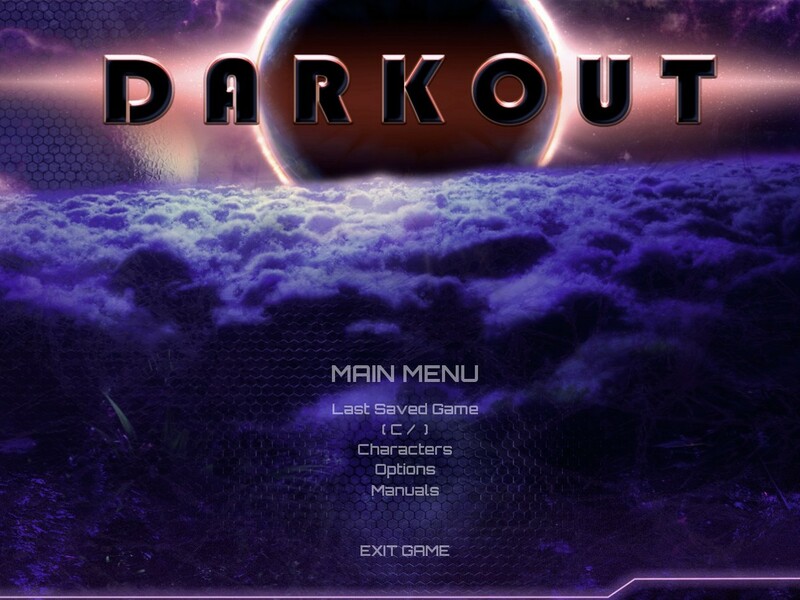 Darkout has come a long way, and while it has some dents that need to be hammered out, I’ll gladly say that I had a lot of fun playing it, and could see losing a good sixty or seventy hours. If I wasn’t careful. 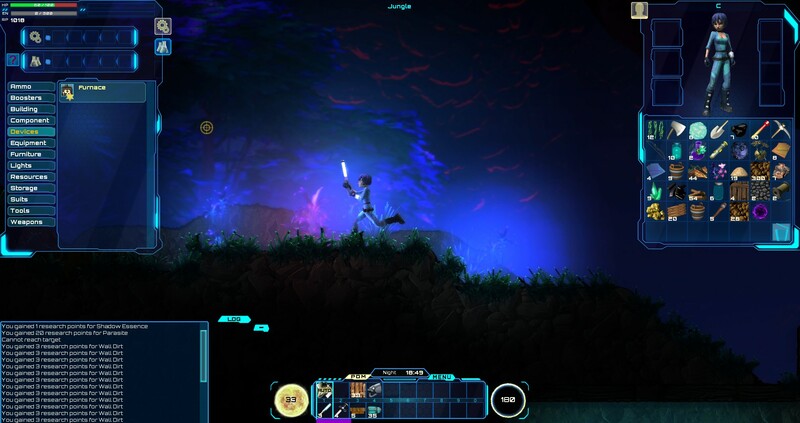 A better in game tool tip system that can round off some of the sharp corners in the early hours of gameplay could really make this a Darker and more technical alternative to Terraria. 7.1 / 10: Darkout, once the steep learning curve is behind you, is just a few stubborn bugs away from being an addictive treat of a sandbox survival game.